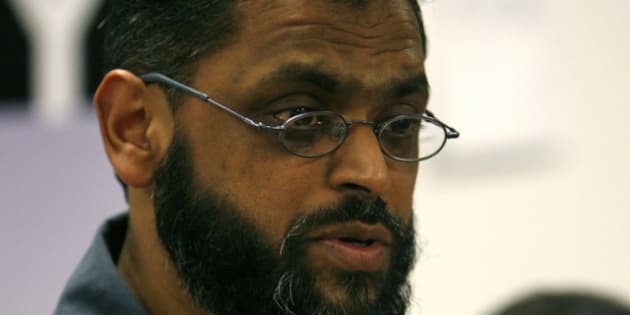 British activist Moazzam Begg jokes that he’s just become the first former Guantanamo Bay detainee to set foot on North American soil – even if it was only for five hours. However, it was no laughing matter at the time and Begg, 43, says he is consulting with lawyers about suing Canada for denying him entry. The director of the London-based civil liberties group Cageprisoner says that minutes after his Air France plane touched down at Montreal’s Pierre Elliott Trudeau Airport on Sunday afternoon, three officers boarded the aircraft and escorted him to immigration. Officials told him he could either stay in detention and challenge the decision to deny him entry or return home, Begg told CBC News. He chose to board a flight back to London that evening. “It seems like the Canadians are very polite even when they’re doing the worst of things,” Begg replied when asked his impressions of his brief sojourn to Canada. It’s the second time in five months Begg has tried unsuccessfully to enter Canada. The first attempt was aborted before Begg boarded a Toronto-bound flight in London. Air Canada staff told Begg he couldn’t board the flight due to his name being on a U.S. no-fly list and the possibility of the flight being rerouted into U.S. airspace, he said. During his second attempt to enter Canada, Begg specifically chose the more northerly Paris-Montreal route because it was less likely to enter U.S. airspace. According to the document, Begg signed a statement for FBI agents while detained in Afghanistan in which he admitted attending al-Qaeda training camps and stating he was prepared to fight alongside the Taliban and al-Qaeda. Begg said those statements were secured while he was being tortured. The Canada Border Services Agency said it would not comment on individual cases, but that their officers are responsible for assessing the “admissibility of persons seeking entry to Canada” based on information available to them at the time. Begg travels the world talking about his experiences in the U.S. detention facilities in Guantanamo Bay, Cuba, and Bagram, Afghanistan. In U.S. diplomatic cables released by WikiLeaks, Begg was praised by the U.S. ambassador to Luxembourg during a visit to the country, particularly for his campaign to persuade European countries to take remaining Guantanamo inmates. Begg said he has visited more than 20 countries in Europe, Asia, the Middle East and Africa, but only Canada has ever denied him entry. The author of a book about his experience, Enemy Combatant: My Imprisonment at Guantanamo, Bagram, and Kandahar, Begg was arrested in Pakistan and held at several U.S. detention facilities abroad from 2002 until 2005. He was never charged with any offence. Begg had planned a 14-day trip to Canada to meet with Maher Arar and Abdullah Almalki, two Canadians renditioned to Syria where they were tortured. He also hoped to meet with the family and legal team of Omar Khadr, the only Westerner still held in Guantanamo. Begg met the Canadian in the U.S. detention facility in Bagram, Afghanistan, in 2002.